The BUild Lab has ushered in many new programs in the short six weeks it’s been open. Now, it has brought the entrepreneurial nonprofit 1 Million Cups to Boston for the first time. On Wednesday morning, the BUild Lab hosted the first 1 Million Cups event in Boston, which showcased two local startups: The Collective, run by BU freshman Sarah Greisdorf, and the Cannabis Community Care and Research Network, run by BU grad student Marion McNabb. 1 Million Cups is an initiative to educate and engage entrepreneurs in different communities, giving people resources to break down barriers that stand in the way of their goals. As of this year, the project is active in 160 communities across the United States. 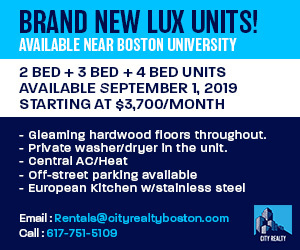 “I think BU is uniquely positioned, as the largest university within the city of Boston, to bring many other resources together,” said Rachel Spekman, program director of the BUild Lab. Each month, Spekman said, the BUild Lab plans on having local startups come and present their ideas, matching a monthly theme. For March, the theme is empowering women, to celebrate Women’s History Month. Greisdorf, who founded her company, The Collective, in 2017, presented at the event. The Collective is a company that directs customers to various clothing stores with clothing items with functioning pockets for women. As of right now, Greisdorf said, the company has partnered with one group and is looking for more small brands to connect with. After the presentation, the audience broke off into groups and discussed ways to help Greisdorf’s company through advertising, marketing or sales, and then met back as a large group to discuss their ideas. The aim was to create a supportive environment and get ideas flowing, Spekman explained. 1 Million Cups was created in 2012 by the Ewing Marion Kauffman Foundation, which provides educational and entrepreneurial programming for communities across the country. The initiative is always looking to improve and expand, said Kim Wallace, the director of engagement and entrepreneurship at the Kauffman Foundation. The BUild Lab is one of five Boston-based organizations partnering with 1 Million Cups to host events for local entrepreneurs. Two of the other participating community organizations, TiE Boston and MassChallenge, were also present at the launch. TiE Boston is a nonprofit group established in 1997 that seeks to help the Boston community by providing mentorship, advice and expertise to budding entrepreneurs. MassChallenge is another nonprofit that calls itself “the most startup-friendly accelerator on the planet.” They award more than $2 million in equity-free cash prizes each year. For April and May, the themes will be giving back to the community and artists, respectively. 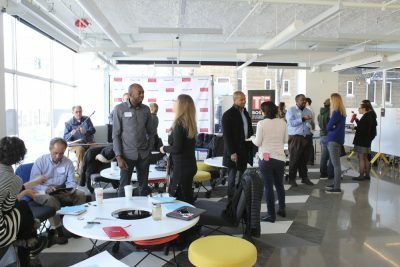 The goal with 1 Million Cups — and future BUild Lab events — is to connect students to the city of Boston, Spekman said. CORRECTION: A previous version of this article referred to 1 Million Cups as a startup accelerator. 1 Million Cups should be referred to as a nonprofit. The current version reflects this change.